Quality Management Tools and Techniques. TQM Tools and Techniques … When implementing any improvement process within a manufacturing or service environment, you need to have the ability to identify potential improvement opportunities, then systematically implement those opportunities for ongoing improvement. A key requirement in an effective process improvement strategy is that change is based on fact, involves input and buy-in from key stakeholders, is cost effective, timely, measurable and can be maintained. To achieve the above you need a set of tools and techniques, which you can apply, to problem solving or opportunity achievement. Total Quality Management is an approach to business that aims to maximize the competitiveness of an organization through continued improvement of its products, people, processes, services, systems and operating environment. TQM enables an organization through a coordinated strategy of teamwork and innovation to satisfy continually increasing customer expectations, needs and requirements. In the TQM organization, the focus of management is directed towards meeting customer needs, which are all important and from which sales and profits will follow. It is about empowering all employees who are seen as resources to be developed. Suppliers are treated as business partners whose success is vital to the success of the business itself and who have invaluable technical expertise which can be utilized in improving the end customer experience. 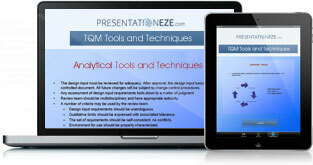 What does implementing TQM involve? The implementation of TQM means the empowerment of all employees through increased communication, education and training. Successful implementation requires the use of specialist knowledge. “Experts” are used to set up quality standards, procedures and work practices to effect the cultural change of the organization. While the initial investment is relatively high, the investment pays dividends in the long run. Worker expectations are fulfilled, customer loyalty & satisfaction generated, good operating standards are raised. The result is that lower overall operating costs can be expected. In the TQM organization, the focus of management is directed towards a) meeting customer needs, which are all important and from which sales and profits will follow b) empowering all employees who are seen as resources to be developed, c) treating suppliers as business partners whose success is vital to the success of the business itself and who have invaluable technical expertise which can be utilized in improving the end customer experience. TQM places an emphasis on the understanding of process variation, the importance of measurement and diagnosis, the role of the customer and the involvement of employees, at all levels in an organization, in pursuit of continuous improvement and reduction in variation between products and services. You need to approach Total Quality Management via..
• Customer Focus (Internal & External). • Scientific approach to decision making and problem solving. • Employee involvement and empowerment at all levels. Implementing an effective total quality process should be seen as a long term objective for an organization, however, while the project may be long term, the benefits will start to accrue in the short term and will exponentially increase as the TQM system develops.